Shiny Gold Sigma and Ultra Shiny Gold Sigma are both fantastic games. These two versions are almost identical, but the ultra is the upgraded version with lots of new features. Luckily, the cheats listed below will work whatever version you have. Note: Cheat codes below are fully tested on My Boy GBA Emulator for Android but these cheats could also work for any Game Boy Advance emulators that supports GameShark codes such as John GBA, VBA, VBA-M and GBA4iOS. Instruction: Press L+R before using pokeballs. Do not use on double battle, it has Glitch. Enter code 82031DBC XXXX and replace XXXX with teleport location ID. After activating the cheat, go to Mart and buy the first item in the list. Next, see the item in your bag. Replace “XXXX” with the ID of the Pokemon you want to meet in wild. IF YOU FIND MORE CODES LET ME OR THE DEVELOPER KNOW, THANKS. 0381 = KYOGRE MEGA? PRIMAL? There’s still more cheat codes for Pokemon Ultra Shiny Gold Sigma and Shiny Gold Sigma that I haven’t yet tested. I’ll update this page as much as I can whenever I found and tested a new cheat for Pokemon Ultra Shiny Gold Sigma and Shiny Gold Sigma. Got a working cheat code for this game that has not yet listed on this page? Don’t hesitate to share it via the comment form below. I tried the code and yes it’s working. Thanks for sharing pal and just want you to know that I’ve added the code in the list above with your name as credit. I just did a 2nd challenge in the pokemon league. But when I got to Bruno, I’m stuck coz the walls of the league isn’t opening. Switch to MyBoy GBA emulator if you’re going to use cheats. I cannot progress past the point where I got the GhostBuster, I keep running around trying to find the person to teach me how to use it because that’s what the game said something about. Everywhere I look I cannot find anyone. The spirits keep me from progressing in Cerulean city. Anyone with advise please help. how to get a water shuriken move tm? I just found some more codes for the Teleport Cheat. Very useful. Thanks for sharing Joshua, I just added your codes in the warp/teleport cheat section. 1) How to get Ice stone for Alolan Vulpix/Sandshrew? 2) Where is the Move Tutor? Thank if you will answer! I have gym badges all the way up to olivine but the game won’t allow me to surf. What should I do? So how come whenever i use the shiny code the pokemon are always female locked, I even had the gender modifier code on where they’re supposed to be always male and didn’t work they were still female. Why? Hi there Zengask thanks for dropping here. Actually, that’s the downside of using the shiny cheat and unfortunately we can do nothing about it. Pairing the shiny code with gender modifier won’t help as well. Cheating isn’t 100% supported in Pokemon gaming and that explains why the shiny cheat and other cheats are often buggy. hi does the wild pokemon list work on open emu? Hi, I don’t encourage using OpenEmu if you wish to play Pokemon and use cheats as it doesn’t fully supports cheating. I recommend installing Bluestacks in your Mac and downloading My Boy in it, that’s what I did. I used the cheat to get litten and now when he goes to evolve it stops and shows a ?. Anyone else have a similar issue? Maybe it’s just what happens to Litten in this game. Happy to know that pal. Is there a Fast egg hatch cheatcode? is there a ev max code? Say What?!!! Thanks a lot! Where exactly in Cianwood? I could have sworn I saw a code for Goku 4 and Frieza in here but I can’t find it! Sorry pal but you are in the wrong game, it is Pokemon Mega Emerald X & Y who has the code for Goku and Frieza. Haven’t heard that rom hack before. Check the comment of “Kuroh22” he shared the code for max IV and nature modifier. Hey Stray, thanks for sharing your codes, this is surely useful to all USGS players. Just want to let you know that I’ve added your codes in the above list which you can find under “Guest Shared” section. Hello, Love the mod. just a few questions.. in the dragons den, there are doorways blocked.. walked through walls and im stopped with a shop sign ” all in one stop shop” or something. how do i unlocked this room ? Are there gameshark codes for pokemon after gen 3? Why does the game turn black whenever I used the wild pokemon modifier (specifically after encountering the pokemon and trying to use an item). I’m trying to catch a bulba. BTW I’m using VBA emulator on windows. Do you use master codes? Hi is there any good working exp cheatcode i dont want to grind to beat some gyms….. Either use the Rare Candy or experience cheat above. I prefer the rare Candy as like to level up gradually without the grind, but still be at least 5 levels above the competition for and added edge. To each their own. Where is the move tutor everyone? Hi, why does Mewtwo Y turns to juat Mewtwo after I catch it? Maybe this is a bug in the game. Kindly check the infinite cash cheat link that’s how you should add the codes. If that didn’t help, maybe you have My Boy free version? in that case you need to watch this video. The rare candy cheat isn’t working for me……. anyone please help me…. 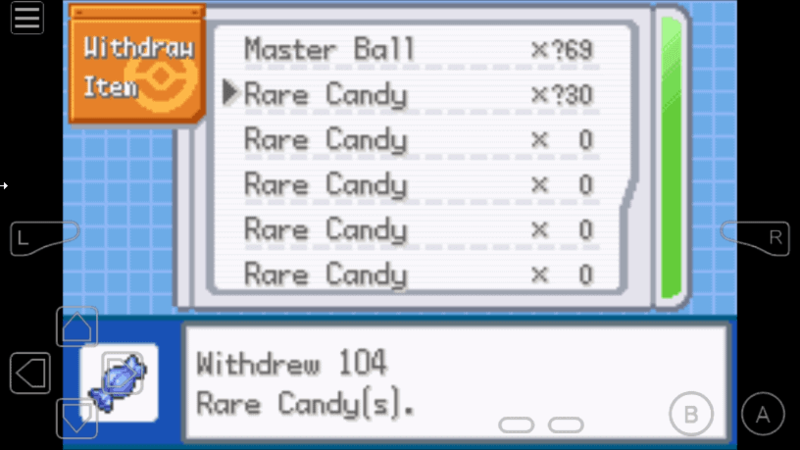 You can find those rare candies in your Pc in PokeCenter. Try switching to My Boy GBA emulator instead of using John GBA. How am i supposed to use the codes when am just using the free gba not the premi, which i can only use 1 line of codes..
You may want to check this video I created on how to enter multiple liner codes on My Boy free version. Hi how can i get weavile? i cant seem to evolve or find a code for it. How do I make Necrozma turn into Ultra Necrozma? or is there an evolution stone? Beat gym leader Chuck then go back outside of it gym and then talk to the nearby lady to get the HM surf. Zygarde learns Earthquake as it levels up. As for Dragon Claw, Zygarde can’t learn that, as it has no claws. Whenever i see the stats (pressing on: “summary”) of a Pokémon shiny the game freezes, can you help? Pls. I’m using my boy, for Android. Where will go next and how to get eevee after I made a cheat for a Pokémon named Eevee? Nope, but let’s hope someone will share the code. Edit: I’ve made an update to the list, I added the cheat code for leaf stone and other items. Kindly check the “Msc items section”. How can I get an ice stone to evolve alohan vulpix is there a code for that or is it by level up? What’s the difference between ultra shiny gold and shiny gold? Cause I wanna play the better one. Ultra Shiny Gold Sigma is simply the new and improved version of Shiny Gold. It has Mega evolution, new items, better game features and other cool stuff. Try this for max iv, i tested with another game with the same rombase and it work. Change the last two digit (Hex,1F=31;1E=30) if you want another IV. Hi guys whenerver i use the shiny cheat i only get male pokemon even if use the “onmy female” cheat but i wanted a Shiny Ralts to get a Gardevoir do you know how to solve this please ? Actually that’s the problem with the shiny cheat and there’s no way to fix this, sorry Yerima. Hi there bro, it’s been already shared by Keanu. Please check the “Mythical, Mega Evolution, Wild Pokemon, Primal Reversion and Alola forms” section. Got another code to share? I’ve tried to use this cheat multiple times for Zeraora and others so I could go through the whole game with them from the beginning but every time I put it in nothing happens? Yo whenever I try to use the “Mythical, Mega Evolution, Wild Pokemon, Primal Reversion and Alola forms” cheat it accepts it but nothing happens, I’ve tried multiple times with different Pokémon, any help? Which GBA emulator are you using? If you have GBA4iOS then most likely the cheat won’t work. Cheats for nature modify and IVs modify please!!!!! I’ve just found this code. Is for making Pokémon have full stats. It actually works on the 1st Pokémon so if you need it for a certain Pokémon put that one on the first place. Note: this code makes every stat goes 999 no matter IVs or nature. I’m not THAT cheater thats why i’m asking for IVs and nature modifier. The EVs training Is not a problem for me. Hey Pokémon Coders, I’ve got some item codes here that people have been asking for. Hey bro, what an amazing share. Just want to let you know that I’ve added your codes in the above list. Check Hack Based Evolutionary Items section. Thank you for the share. will fire red cheats work on this rom? When activating the shiny cheat be sure to disable all other unused cheats. It’s always a best practice to enable only the cheat you only need. i caught primal groudon; and now i just have normal groudon i tried giving it mega stone a to primal evolve in battle; didn’t work; i tried giving mega stone z and it still didn’t work; how do i get primal groudon? To get primal groundon you need to first have a mega bracelet and a mega stone. Then you give the mega stone to groundon then when you go into battle, and go to the moves to attack the opponent you will see a mega stone next to the name and you activate it by pressing the start button. Select a move to attack the opponent then it will say groundon is reacting to the mega stone and then you get primal groundon, but when the battle finishes it will turn back to the normal groundon. Hope that helped you, Jacob. Cable link code please ? How do you get Umbreon? Is there any code to hatch eggs quickly, Some of these eggs are taking FOREVER. Are you playing on ur phone because this happened to me too while playing on myboy emu but now im playing on pc with vba emu and everything is fine but i see some pokemon in my dex that i never caught or see like pachirisu or mime jr.
Here’s all of it guys…. do you know the code for False Swipe? Hi there XD, same thing happened here with my GBA4iOS. I believe it’s the GBA4iOS causing the problem. Can you give me the code of water shuriken. 1. Input master code first. 3. Go to move tutor to obtain moves. 4. The first blank in the move tutors list is the move you entered. Click it. And viola the move tutor will teach that move. P.s must have mushrooms in bag. Thanks again for the share Mark, very much appreciated and this is super useful. Can you please add in morr TM move enabler codes. ? Like shadow ball, megahorn, dark pulse or crunch .. but i very appreciate you all guys did. Thank you. Can you add more. Like megahorn, dark pulse or crunch any additional dark and dragon moves like, outrage etc and shadow ball. But all you had already share is very appreciated man. Thanks. Where can i find mushrooms? Is there a code for mushrooms? Where is the move tutor? Is there any way to get Sylveon? Hey guys i just made an exciting discovery…. I was just expermenting on my gba for new codes…. And i just discovered the cheats for mega stones…. Hi there Mark, what an excellent discovery. Thanks for sharing and keep coming. My pleasure….. Btw did u tried it already??? Yes, I tried it myself and it worked perfectly, see preview image. what is the cheat for metal coat? Guys what is the cheat code for mega bracelet??? 82003884 0161 in a pokemart or 82025840 0161 in a pc. i did not understand how to use the cheat? i did not understand how to mega evolve? without using any cheat, where can I get torchic? Howdy Mike, sorry but I don’t have any idea on this. The USGS facebook group page is the best place to ask a question like this. Well, that’s the problem with this cheat and we can do nothing about it. Sorry pal. You should use a pokemon with knock off (move) then the focus bands would be knocked off the foes, then you shiuld faint ’em. help me please!! my pokemon menu is gone i can only see the other menu’s like pokedex but i have my pokemon if i fight on other pokemon please help me! is there a cable link cheat? Hi where is the Ho-Oh cheat code????? The code is in the “Wild Pokemon modifier” section, care to check it again? Help please….. I am in Ecruteak City and I some how ended up in a void room with no visuals except for my menu, which I can use, I saved in the spot thinking it was some kind of challenge room…. I can not use escape rope, dig, or fly as I have not got that yet….. I would greatly appreciate feedback on how to fix this issue. 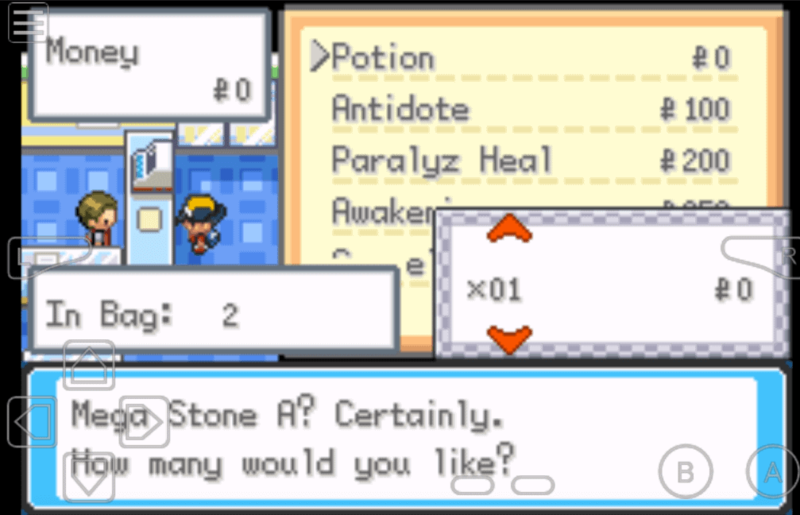 Maybe a cheat to faint your pokemon so you are sent back to a Pokemon Center or the ability to use escape rope anywhere. Hi there, how about using the walk through walls cheat have you tried it? 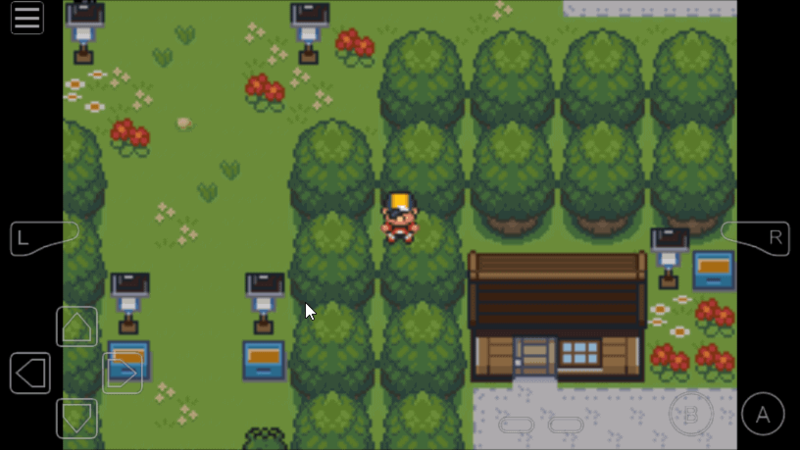 The Walk Through Walls cheat does not work, as when it is activated, on my paid version of MyBoy, there is no visual indicator that I am moving; however there is an auditory cue that suggests that my character is in a room that is exactly 1×1 and makes the sound of hitting the wall. If you have any other suggestions please help. Thank you for helping me with what you have done so far. In that case, maybe the author of Ultra shiny gold sigma or other player can help you fix your problem, check Pokémon Shiny Gold Sigma Facebook page and Pokémon Shiny Gold Sigma Facebook Group. Thank you for your help and your time that you have spent with me. You’re welcome mate, it’s my pleasure to help my fellow Pokemon gamers. Otherwise how can I get an Electivire? Where is the mega stone? Hi there, sorry to hear that mate and I truly understand your frustration. But here’s an easy trick and the fix for your problem – Enter the next line of code as a separate cheat. For instance, the walk through walls code is 509197D3 542975F4 78DA95DF 44018CB4, you need to enter the first part of the code which is 509197D3 542975F4 as part 1 cheat code and 78DA95DF 44018CB4 as part 2. The result should look like in the image below. The same steps for 3 or more liner cheat codes. I know this is a bit hassle but definitely worth an effort. Hope this helps. Thanks for dropping here pal and I’m happy to know that my cheats works for you. Try not to mix this cheat with other cheats. Also, disable all other unused cheats. Random glitches such as bad egg and crashing happens when your ROM get confused with too many enabled cheats at once. All the wild pokemon modifier cheats don’t work.. And for wild pokemon modifier cheats on the comment don’t work either, makes my game freezes instead. Anybody has the same problem with me? I just want to ask why i cant use the other pokemons ability? For example “Poiple’s ability is beast boost if you KO an enemy it should boost the stats but on mine i don’t. Is there any way to get a Dusk Lycanroc? 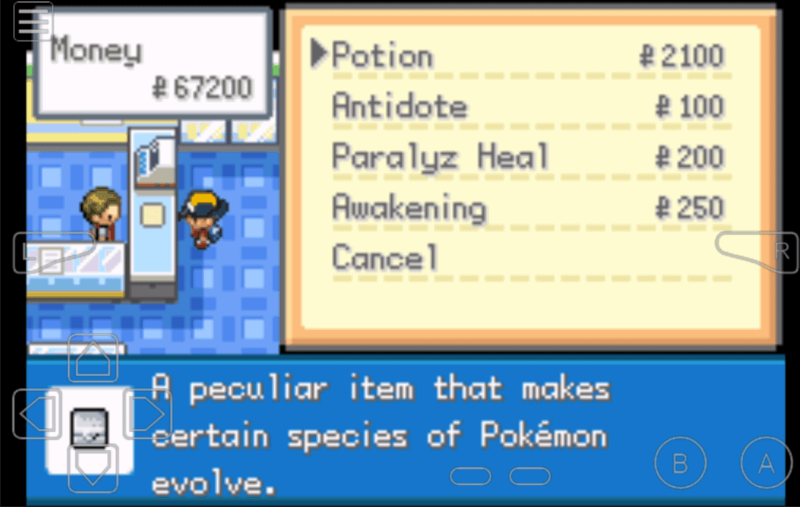 Does this wild pokemon modifier also work on john gba? A Gallade evolves from Kirlia by using Dawn Stone. So lets test with Kirlia. There’s a code there for Gallade and it’s “0210”. Were same i like Gallade too. The move “Stored Power” is amazing! How did you get the Pokemon Modifier codes to work? Are these codes meant to be used with codebreaker? Does anyone know where dive is? I used the cheat for it and I have 8 badges and still cant use it. That’s a regular thing, after you mega evolve a pokemon after battle,they will return to their natural form. This logic applies after catching mega evolutions. How far is everyone into the game? I want to know if anything weird happens if you try to catch gens 5-7 in the wild without cheats. hi , anyone know the cheat code for mega stone. my mega stone disappear ,only gt mega stone z in my bag ? that mega stone z is what u need, just equip it to any pkmn capable of mega form, press start during a battle then select an attack.. We dont yet know the code for mega stones. Some of the items in your bag that you hack in may not appear when you play your game again. They do appear a couple minutes later. From what I can tell using the pkmn cheats is unstable, this is 2nd time my saves have disappeared so I’m gonna play thru with just the 100% capture rate and infinite money. Im aware of that problem, the developers still have some work 2 do. The zygard 4 I just caught was carrying a “??????? ?”, dont try to take the item 2 see what it is, if you try your game will freeze. Safe advice would be to not remove any items from any pokemon past gen 3 unless you plan on testing. I don’t know, the species modifier codes work for me even without a master code, I use the paid version of my boy. Very very useful to the community and this must be a lot of hard work Keanu. Thank you so much for the share mate. 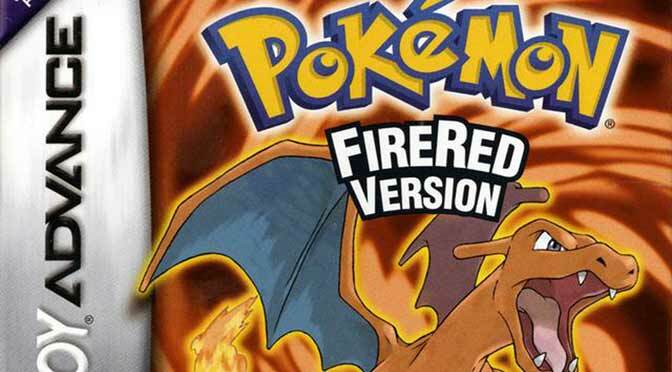 I’ve added your codes above in the “Mythical Pokemon, Primal Reversion and Wild Pokemon (Contributed by: Keanu)” section. Pokemon I didn’t run into during my grind was, articuno, zapdos, and moltrez. Wow! Really? That’s incredible bro. Thanks again for sharing. You know pal? It takes me forever to gather those codes myself since I’m working a lot of things such as testing rom hack codes, but thanks to you. This is a huge help to every Pokemon fans. Have a question all pokemon modifier isn’t working. I’m using gba4ios iOS. Please help…. thanks. Hey coders, Idk if u noticed this problem, but while i was testing I noticed a save error, when I reopened the game my save file was gone, look out for that. Noted. Thanks for that info pal. Why my poiple’s abilty (BeastBoost) doesn’t work? How can i make it work? I won’t boost stat each time i KO enemy. Im close to finishing, Yveltal is 0302 for those who want it, your welcome. Is there a code for darkrai? There is, but until the complete list is available ull have 2 experiment for yourselves.. To me the values and at 0399 with PichuSpike, u dont want to go past that without saving. For those of you that don’t no, this is just 399 values, you must also do values such as this example: 021A or 03B5. I meant NOT just 399 values, sry for the typo… I could make the complete list but that would take a long time, ill leave it to the developer.. Great game tho my dude. I havnt round 2 the original lucario code cuz there I codes that I missed That I will finish later, but here is Lucario Mega 037D. I can not get the rare candy cheat to work what are the steps to do it? 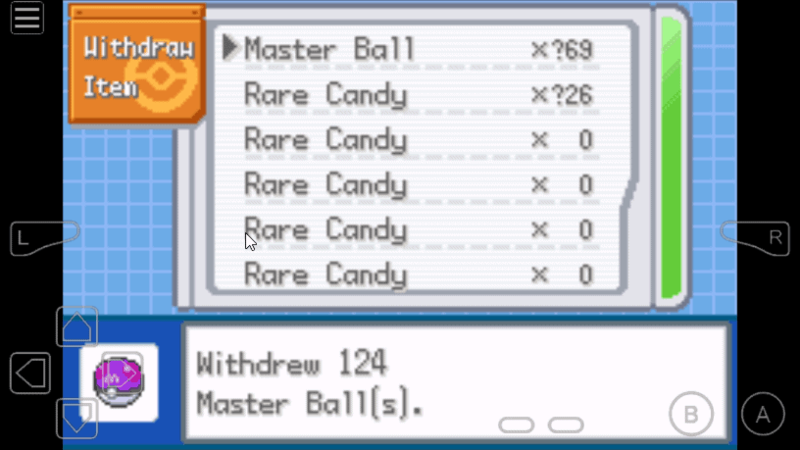 After activating the cheat, go to Pokemart and check your PC to withdraw the candies. I’m not sure I can find but I will look into that. Mega stone and gem please. Cant find a pokemon Modifier cheat that works, I’m using GBA4iOS! I can’t find the cheat for mega gem but I will surely add it here when I found one. Can anybody tell me the cheat for x99 items for any item I put in the pc? Actually I am running out of Cable Link item so I just want it to get increased. What GBA emulator are you using? These cheats works best for My Boy for Android and Visual Boy Advance. Cheat for rare candy is not working. That’s impossible pal, I’ve tested the cheat myself and it worked perfectly for me. Check the rare candy cheat again and see the attached image for proof. Ok but how do you get rid of them. I have no room for anything in my bag or box. I play on my boy! You can’t get rid of them, my advice is to restart, go to the 1st poke center, use the cheat outside, grab all the candies u want all at once, then turn the cheat off, same for master balls and all other item codes. Thanks for sharing, this is indeed very useful. What is mega stone cheat..?? Nothing yet, stay tuned as I will update this page once I found the cheat for mega stone. Can u give the full pokemon list for wild modifier? Click on the “Wild Pokemon Modifier” that’s the list of all Pokemon. But, is there a marshadow code? None so far, but I’m working to improve this list. 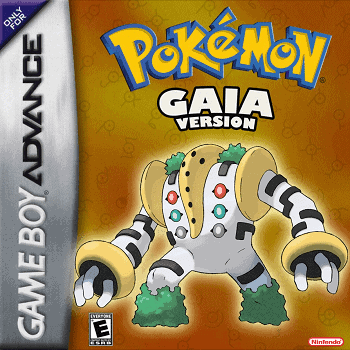 Try switching to My Boy, I even have paid John GBA and the cheats doesn’t seem to work as well. 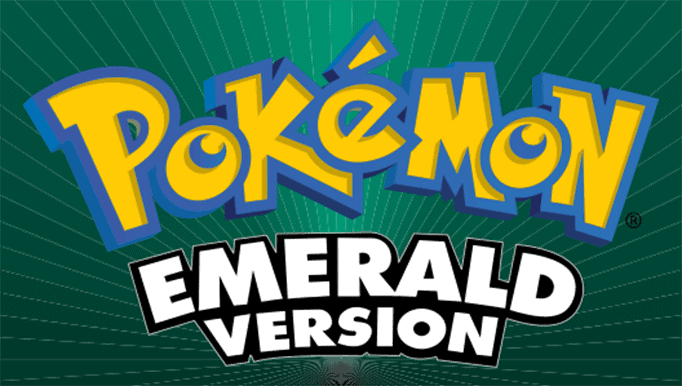 My Boy is the emulator that I highly recommend for those who want to use cheats. For My Boy free version users, you need to follow this instructions on how to enter multiple liner cheat codes.